This Puja must be performed by you in person with the Pandit, which means traveling to Mount Soma on that day. Traditionally, people perform this Puja once a year and make offerings to their ancestors (3 generations on each side of the family). This gives blessings to the family and helps support family harmony. If your father is still alive, you need not perform this Puja. The eldest family member should perform the Ancestral Puja. It is most auspicious to perform this Puja on the tithi date of the death of one’s father. If you don’t know the tithi date, then it is most auspicious to perform this on no moon day. If you cannot perform this Puja on no moon day, then you can come to the temple any day during this Ancestral Puja period. If you cannot perform the Puja during this period, you can do it on any no moon day during the year. A written list of your deceased ancestors’ names. If you know them, 3 generations on each side of the family. During the annual 15-day period, you can also include names of deceased gurus (important teachers), sishyas (disciples), friends, relatives, in-laws, and siblings. One whose parents are departed should do the ancestor Puja for them. The waning moon of the Vedic month of Bhadrapadamaas is known as Mahãlaya Paksha/Shraddha Paksha. 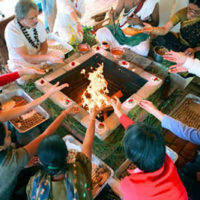 In the Vedic tradition, this fortnight is dedicated to the departed ancestors (pitrus). In the Puranas, there is a true story that describes how important this period and day really is. The renowned hero of the Mahabharata, Karna (the Pandavas half-brother), when he passed on, ascended to the heavenly planets. The great charity he had performed in his lifetime was returned to him hundredfold. But, it was all in gold and silver; there was no food, as he had not given any food in charity! He prayed to the god of death (Lord Yamaraja) and was sent back to earth for fifteen days to make up for this deficiency. For those fifteen days, he fed brahmins and the poor, and offered oblations of water. On his return to the heavenly planets, he had food in plenty. It is these fifteen days that are commemorated in the Mahalaya Paksha. 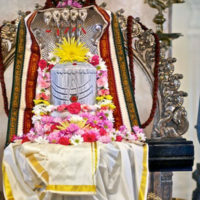 Due to the grace of Yamaraja, it has been ordained that offerings made during this period benefit all the departed souls, whether they are connected to you or not. The offerings reach the ancestors very quickly, like an express delivery. This is the boon of Lord Yamaraja. Jai Sri Yamaraja. We would not be here and be who we are if it were not for our ancestors. If we owe someone money, but he moves away before we pay off our debt to him, the debt we owe him does not go away just because he is somewhere else. 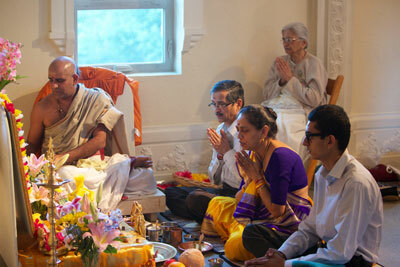 This Puja is a way of giving something back to those who have given so much. The giving of food is considered the greatest charity because it is the only gift that the recipient always says, "Enough! I am full." and is fully satisfied. With this prayer to the ancestors (pitrus), may we all express our gratitude to our ancestors and the Lord during this Mahãlaya Paksha: "Oh pitrus, in whichever form you may be, wherever you may be, we wish to remember and pray for your peace and welfare, and offer you the oblations with devotion. Please bless us and forgive us for any omissions and wrong-doings committed in our life with you on this earth."